Is it that you are losing hair at a high rate and looking much older than what you actually are? Is your hair thinning and baldness making you feel embarrassed at your workplace and social gatherings? Now you can completely avoid this embarrassment by undergoing a hair transplant. It is a very effective way of looking fresh and natural. 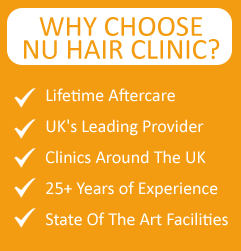 The precious gift of hair transplant has been brought to you by Nu Hair Clinic that operates in Leeds and also at many other places and is committed to provide the Best Treatments for your hair. Hair transplant is becoming ubiquitous in the recent years as more people are suffering from premature baldness. We have always cared for our customers and tried to provide them with the best possible treatments that are custom made. We believe that every person has a very unique problem and that problem must be addressed in a unique way. Our Clinic boasts of providing custom made treatments for specific problems. It has some of the best Doctors who are specialists in the field of cosmetic surgery. They have brought the best Hair Transplant for men women Leeds inherits. Mesotherapy is a medical treatment that is provided in order to boost the growth of hair. It is applied to both men and women. The technique involves application of a specialized cocktail which provides your scalp a vitamin boost that improves the blood circulation in the bald area. Mesotherapy has shown positive results in case of both men and women. The improved blood circulation makes your hair follicles healthier and induces hair regrowth. The treatment is done via an injection gun. This makes the treatment mush less painful and also faster. Slowly and steadily the Mesotherapy solution will neutralize the DHT hormone causing your hair to grow. Mechanically the needle creates perforations on the middle layer of the skin that helps to induce a healing process. This makes room for the cocktail to penetrate faster and there is no real damage to the existing collagen. Chemically the injected active ingredients will make your scalp receive a better blood circulation that will nourish the hair follicles and stimulate the growth of hair. After Mesotherapy if hair is not maintained properly as per the directions of the doctor there is a chance of balding. However prolonged maintenance can help in eradication of further hair treatments such as grafting which involves Follicular Unit Extraction (FUE) or a Platelet Rich Plasma Therapy. Mesotherapy works really well when toxins are eliminated from the diet and you are exercising regularly. The Hair Transplant for men women Leeds have been providing is being enjoyed by many people. We at Nu hair Clinic have taken an oath to make Leeds look younger and happier! We hope you will certainly visit us soon.